When NVIDIA first took the wraps off their GTX680M graphics card earlier this month at Computex, Dell was quick to follow with the announcement that their M17x and M18x gaming notebooks would soon receive the GPU. Now, thanks to the Alienware Facebook page, it looks like the duo of monster gaming laptops can officially be customized and purchased with the latest Kepler chip. With a starting price of $1,499, the base Alienware M17x comes with a Core i7-3610QM CPU, 6GB of RAM, a 500GB HDD, and a 2GB GTX660M. 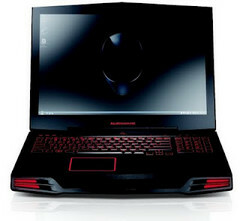 However, starting from today, the 17.3” laptop can be outfitted with the 2GB GTX680M for an extra $550. Dell is also offering upgrades of up to a Core i7-3820QM, up to a 512GB SSD, up to 32GB of RAM and a Full-HD 1920x1080 pixel 3D display. On the other hand, the M18x features the same starting configuration as the M17x, albeit with a Full-HD display and a $1,999 tag. Of course, those looking to go all out can now customize the 18.4” behemoth with either a single GTX680M for $550 or a pair of GTX680Ms in SLI for a whopping $1,100 extra. In addition, Dell has options for up to an i7-3920XM CPU, up to three SSDs, and up to 32GB of RAM. While Dell’s Alienware notebooks are far from a bargain buy, they definitely don’t skimp when it comes to firepower. For those interested, the notebooks can be customized and ordered from Dell’s online store today, with a preliminary shipping date of July 3rd.